This IBM® Redpaper™ publication is one in a series that describes IBM z Systems™ qualified dense wavelength division multiplexing (DWDM) vendor products for IBM Geographically Dispersed Parallel Sysplex™ (IBM GDPS®) solutions with Server Time Protocol (STP). The protocols that are described in this paper are used for IBM supported solutions that require cross-site connectivity of a multisite Parallel Sysplex or remote copy technologies, which can include GDPS and non-GDPS applications. GDPS qualification testing is conducted at the IBM Vendor Solutions Connectivity (VSC) Lab in Poughkeepsie, New York. IBM and Cisco Systems Inc. have successfully completed qualification testing of the ONS 15454 Multi-Service Transport Platform. 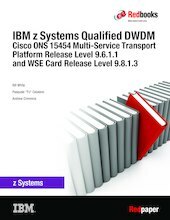 This paper describes the applicable environments, protocols, and topologies that are qualified and supported by z Systems for connecting through the ONS 15454 Multi-Service Transport Platform hardware and software, Release 9.6.0.5 and WSE card Release level 9.8.1.3. This paper is intended for anyone who wants to learn more about the ONS 15454 Multi-Service Transport Platform Release 9.6.0.5 and WSE card Release level 9.8.1.3.